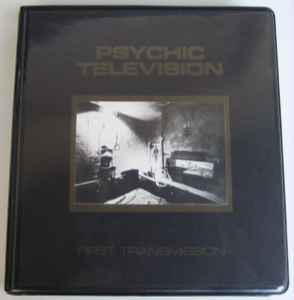 This double video tape was released as a deluxe box set. This release is a limited and numbered edition. One booklet, one poster and one Information sheet were enclosed to this set. The music itself was designed not only as soundtrack but also for subsequent use by Initiates of The Temple Ov Psychic Youth in their rituals as Functional music only to aid in the process of making things happen. It is a practical tool. The video side of PTV is where the head hits a brick wall - visually this hurts the mind more than uplifts, and for the most part, "First Transmission" is either disgusting or boring (once/if you get over the "disgusting" bit), I dare say, even for those who may to an extent "understand" what all the "initiations" in the very video actually represent. The bits featuring Derek Jarman calmly speaking are rather deceptive to what's following all the way through this double VHS set. Of course, one thing that fascinates is the courage of everyone involved to submit themselves to such physical (and mental) self-torture, expecting to reach a higher goal through (predominantly sexual) initiations that cross the border of the obscene. It's hard to say this is pretentious, but once you realise one cannot get out of their own skin, all these ritualistic initiations are rather shallow if not entirely shocking (to the system). The soundtrack is the greatest part of course (early PTV stuff is especially amazing music wise), but when placed in the context of this video, its calm adds to the bizarre and disturbing nature of the whole. could anybody uploadsome poster scans?